These are the last of the Mega Miniatures fire fighters I started a while back. 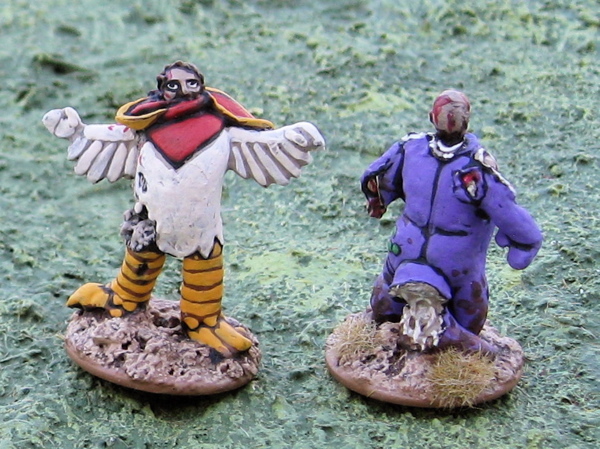 Now I have 19 of them… (it was a pack of 20 and there was one paramedic in the pack – which I don’t think I’ve painted yet…). Not the prettiest figures on close inspection. 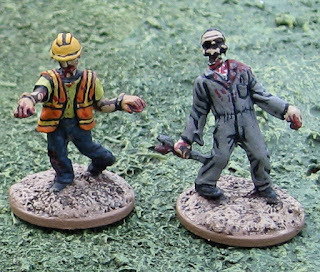 But on the tabletop, surrounded by zombies, it’ll be clear what they’re supposed to be. 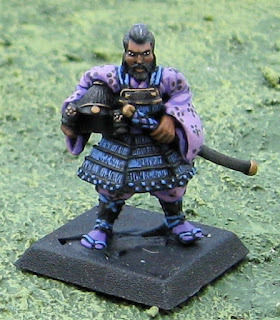 The figure is actually a Unicorn Clan Hero from AEG’s Legend of the Five Rings Clan War series. Maybe some pictures of the buildings I’ve been working on…? 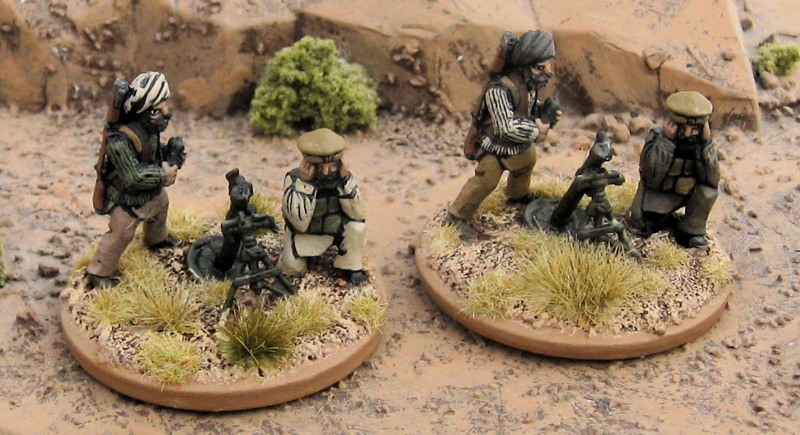 These are some Afghans from The Assault Group. They’ll see action as generic Central Asian Mujahjideen – likely seeing a lot of action in Burkhaderkastan. I also have a bunch from Mongrel Minis Afghans to paint up. When I’m done that (hopefully soon) I’ll get some pictures up comparing Assault Group, Mongrel, Eureka, and Devil Dog Designs. 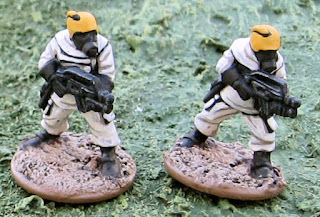 This is a couple more guys for my first CDC/Hazmat Team. 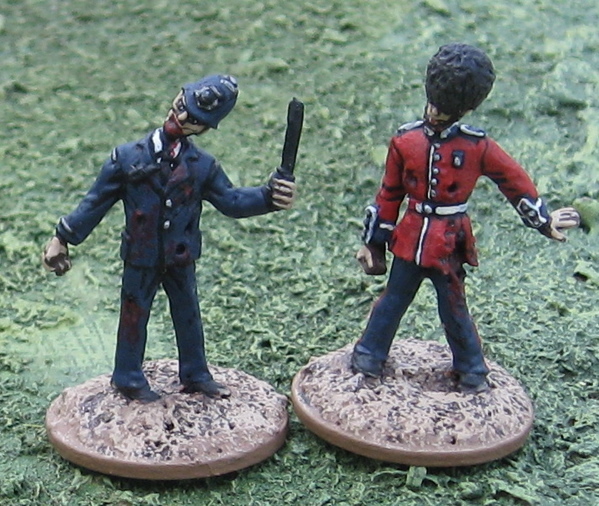 These figures are old Grenadier Miniatures (currently available from EM4 Miniatures). 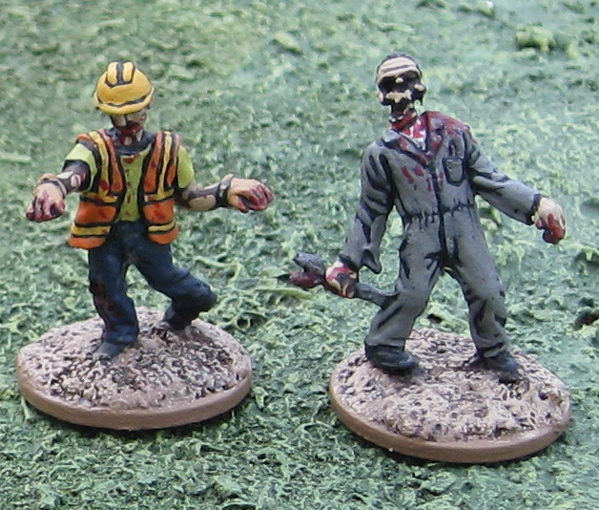 And this is my OTHER Hazmat/Zombie Containment Team. 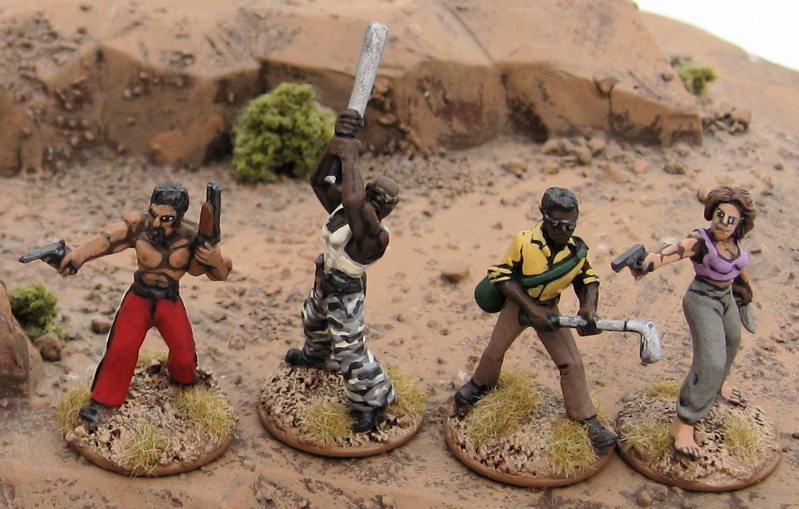 These ones are from Hasslefree Miniatures. Why the heck do I need TWO Hazmat/containment teams…?! 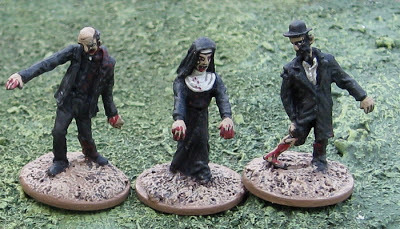 Have you seen how many ZOMBIES I’ve been pumping out lately!? A few more modern British infantry from The Assault Group. I think I’m actually finished all the regular infantry for this force. I still have to finish up the Warrior MCVs… and the Challengers…. 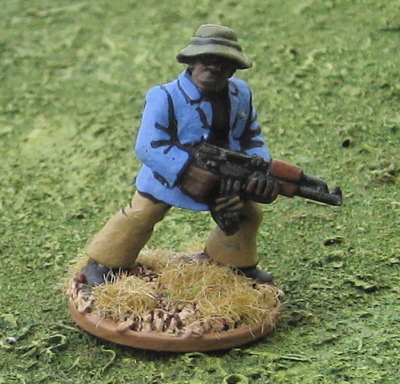 And then there’s all the SAS and Marines… and I’m not even thinking about the COLD WAR era British… But still… finished stuff is finished stuff – gotta look for the little victories here or I’d be mired in despair. Some dead modern British from Brooks Miniatures. A little camp fire. I think this came with the Renedra plastic tents I picked up a while back. Maybe a year end round up… some plans for next year… a bit of last-minute painting…? 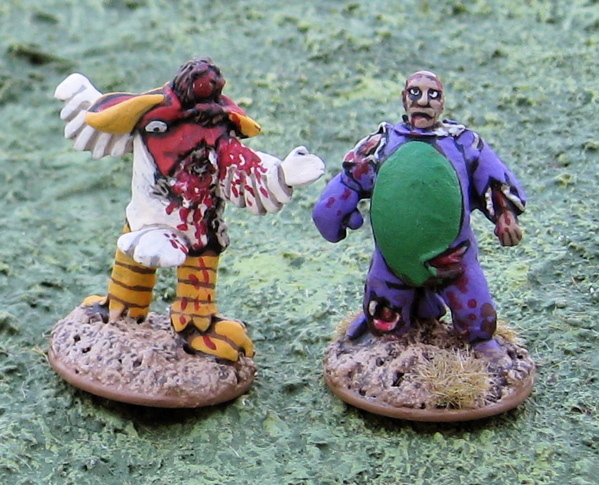 The Horde… adding to the Horde I already have I have about 66 painted zombies. I have another 65 to do. 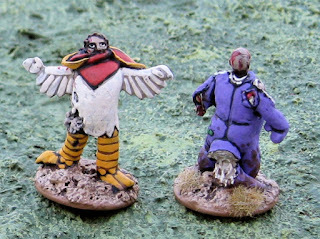 I’ve just realized, looking at these pictures that I’ve taken, I totally forgot to finish the based on the chicken mascot zombie (front and center, there) – which is the only miniatures in this lot that isn’t from Cold War Miniatures (it’s from Victory Force Miniatures). 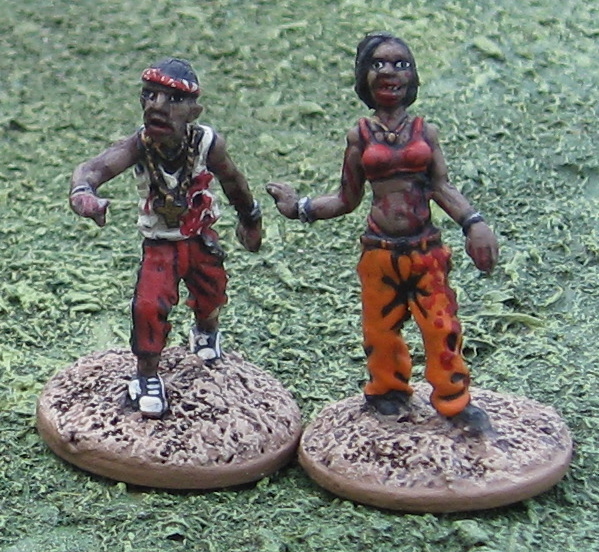 Couple of ganstas from the “Downtown” pack. These are Germans from Eureka Miniatures. Here’s how they all look together… The Eureka and Hasslefree G36 rifles are actually pretty close in proportion and fit nice together. 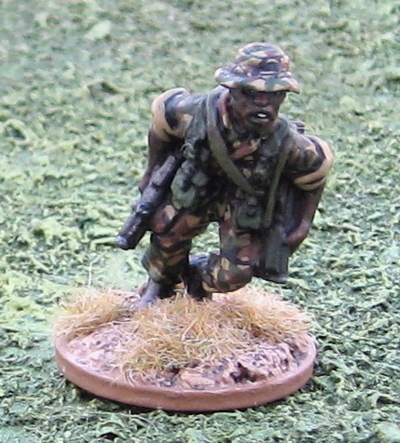 An odd African Militianman – also from The Assault Group. Finally the second Afghan (or Burhkaderkastani?) motorcycle from Empress Miniatures - this time with an RPG team! More toys of a modern sort. I may make it to 1200 28mm foot this year yet… I’d like to round the mounted off to 100 as well, but we shall see. Complicating my plans was the arrival of the last two orders of stuff. Now a sensible person that was trying to paint another 55 guys in a week would put those aside and ignore them for a week… but, oh no, not me… As new minis arrive I seem to have to take them out, base and prime them before putting them away int eh storage drawer they’re going to stay in…. and another 200 figures showed up today… (I’ve been a little out of control this year… like MORE out of control than normal…). Downed aircrew from West Wind Productions. Finally a lone survivor from Victory Force Miniatures (lone, as in the only one I’ve painted so far and am posting today – there were four others in the pack of “Armed Office Workers” that this guy came in). Gary stopped by this evening to play some Force on Force. I quickly threw together a scenario to try out some new things. Essentially, I used the “Contracting Trouble” scenario from the main rulebook, except that instead of Iraq it was set in Occupied America circa 1986 (think Red Dawn – the original one, I haven’t seen the remake…). Instead of contractors the party needing to be rescued were two crew from an armoured vehicle that had been hit and disabled by American Insurgents. The rescue team, instead of being Marines, were Soviet VDV troops. And the insurgents… well… instead of being Iraqis, they were Americans! WOLVERINES!! The scenario called for a 2’x2’ table, but I thought I’d try playing it on a 4’x4’ table and double all movement and optimal range distances, etc. Also my buildings are a bit bigger than the one room shacks I assume the buildings in the original scenario are supposed to be, so a few of the buildings I divided into two sections (usually front and back) and treated them as though they were two smaller adjacent buildings. America has been invaded by Soviet Russians as well as Cubans and other central American communist countries. In the occupied territories a fierce resistance movement has hampered the Soviets at every turn. Initiative: Soviets have initiative for the whole game. 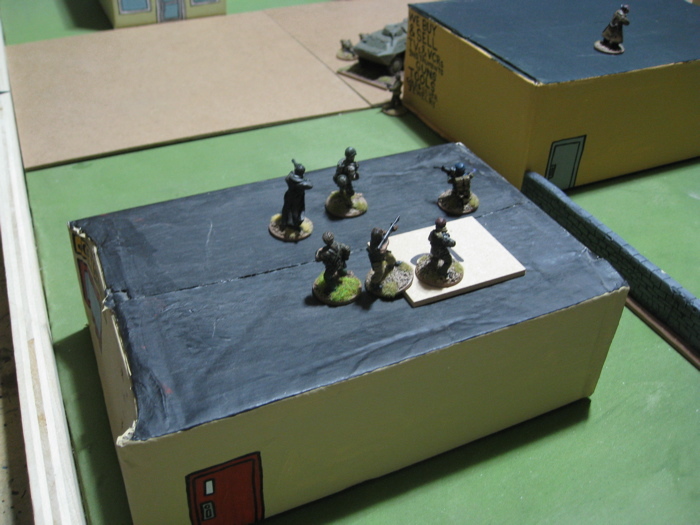 Table Size: 4’x4’ – but we doubled all distance – so it was the same as a 2’x2’ game in the book. An APC of a nearby Motor Rifle Regiment on patrol in town was caught in an ambush by American insurgent terrorists. The vehicle was disabled but the crew was able to keep the insurgents at bay for some time. They are now wounded and out of ammunition. 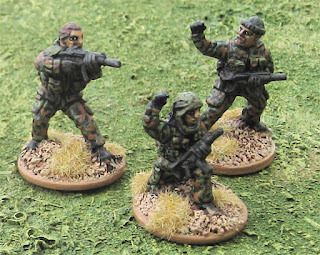 A squad of Soviet VDV are in the vicinity and have been tasked with locating the wounded crew and escorting them off the south or west table edge. 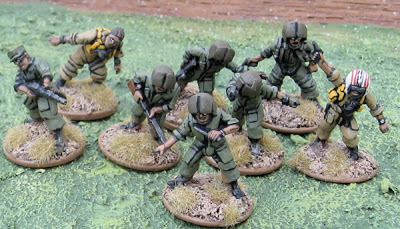 Prevent removal of commie APC crew from the table. 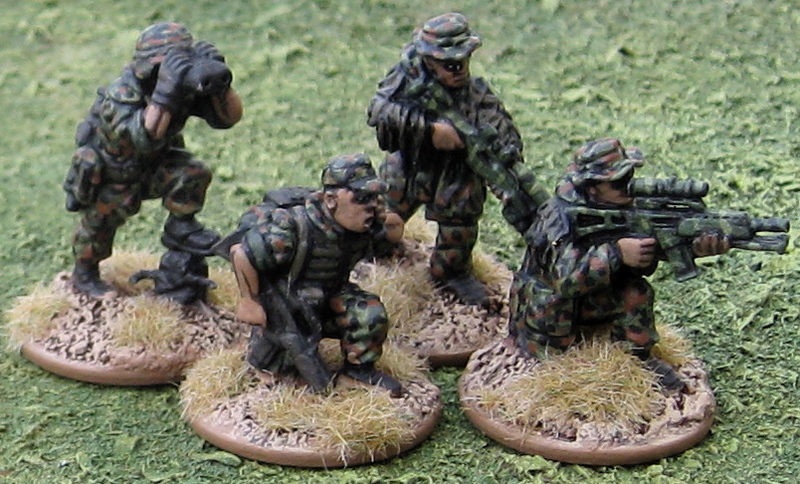 Due to poor command and control, the American Insurgent player may not attempt to seize the crew before the VDV reach them. 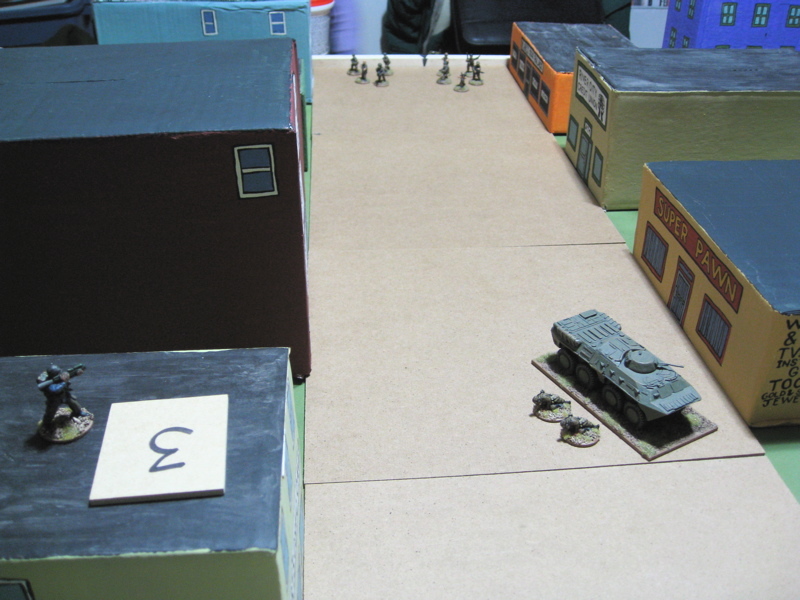 Soviet VDV (Air Assault Troops) wander down the main street of Littletown, USA – the wrecked APC can be seen up the street in front of Super Pawn. Hot Spots #1 (behind the Credit Union) and #2 in Joey’s Service Station. Another shot of Main Street. And another shot (with the solitary Insurgent with a LAW rocket hiding out in Curt’s Comic Cave). Fire Team #2 rapid moved up the street to the corner of the Flower shop and brought fire down on the insurgents hiding in the alley between the building. The Insurgent in the back of the Ivan’s Convenience Store had tried to interrupt but couldn’t pass a Troop Quality test (couldn’t figure out how to arm the LAW rocket he had… or maybe just didn’t’ want to draw attention to his position there with a whole squad of Soviet VDV troopers just out in the street while he was all alone in there… regardless, he took no action). …and they were gunned down where they stood. Fire Team #1 also rushed up the street taking up a position in front of the Credit Union. The Insurgent in Curt’s Comic Cave also failed a TQ test and was unable to interrupt. In the End Phase The insurgent mob behind the Credit union ALSO failed a TQ test and just milled about, perhaps completely unaware that there was anything going on. The Insurgent Leaders that were meeting at Joey’s Service Center decided to get things moving and split up to go and try and whip those pansies into shape. 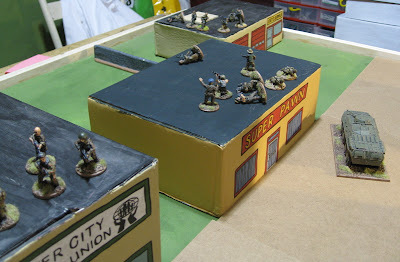 One headed for the group behind the Credit Union, another to the corner of Super Pawn – to take cover before dashing across to Curt’s Comic Cave. Another crossed and went in the back door of Super Pawn. Reinforcements began arriving, having heard the shooting downtown. Another Leader, along with a Machine-gunner and three other insurgents with small arms arrived at Joey’s Service Center. 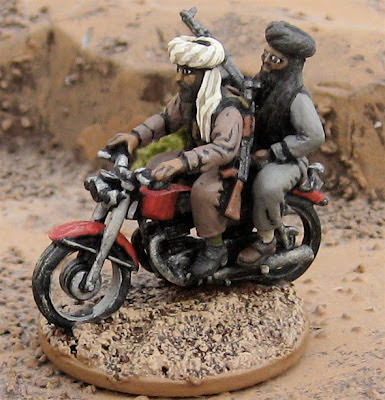 Three more insurgents armed with rifles also wandered in the back door of Curt’s Comic Cave. 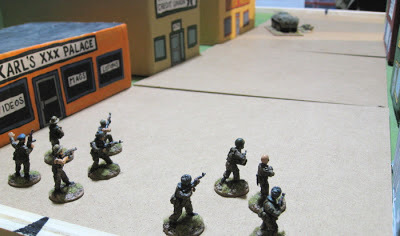 Fire Team #1 pushed forward with some bold and aggressive maneuvering – they rushed to the APC and grabbed the two crewmen before retiring into Super Pawn. The four insurgents in Curt’s Comic Cave were too busy introducing themselves to each other and trying to decide who shouls take up positions where to notice and missed their opportunity to react (failed TQ). The Insurgent Leader in the back of Super Pawn, however, fired on the Team as they entered the front of the building causing one casualty before being riddled with bullets. Fire Team #2 dashed across the street to take up a position in the Credit Union. This time the insurgent in the back of Ivan’s Convenience Store got his nerve up (or figured out how to take the safety off) and fired his rocket at them, blasting ahole in the front of the building, but causing the team no harm. The Soviets returned fire but likewise had no effect. 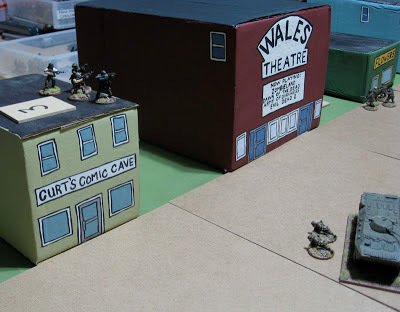 In the end phase the leader hiding at the corner of Super Pawn dashed across the street to join the Insurgents in Curt’s Comic Cave and shouted at them to pull their heads out of their asses! The Insurgents at Joey’s Service Center attempted to fire on the Commies in Super Pawn. 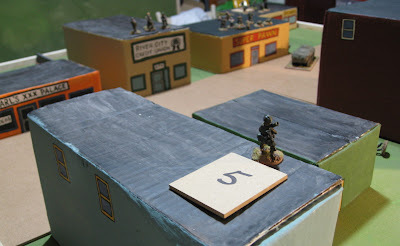 Rolling a one on the reaction test brought a Fog of War card out and and Air Strike on the Insurgent at the back of Ivan’s Convenience Store (Apparently a Hind gunship was passing by and saw the insurget fire on the VDV in the Credit union and decided to light up the building. No more was heard from that fellow!) 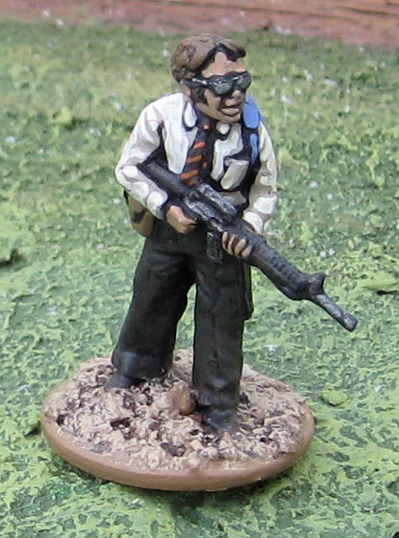 In the exchange of fire (between the VDV in Super Pawn and the Insurgents in the Service Center) the soviets took another casualty and the insurgents took two – including one of the leaders there! The insurgents in Joey’s Service Center were both lightly wounded. 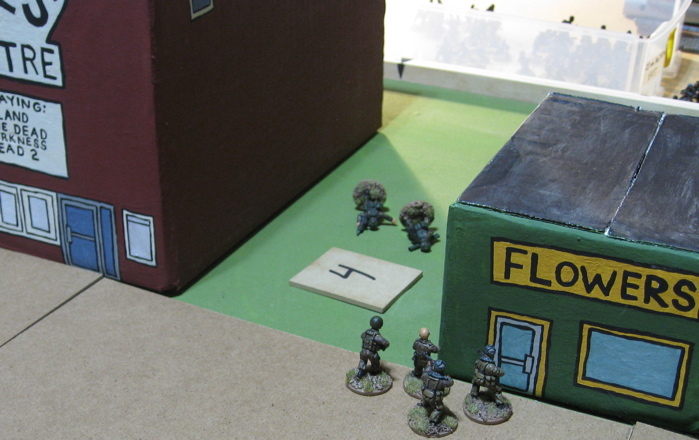 Another group of reinforcements arrive at Curt’s Comic Cave including a leader, an M60 gunner (the roll was for an RPG, but I didn’t have another so I threw out an M60 which also has an AP of 2) and SIX more armed with small arms! 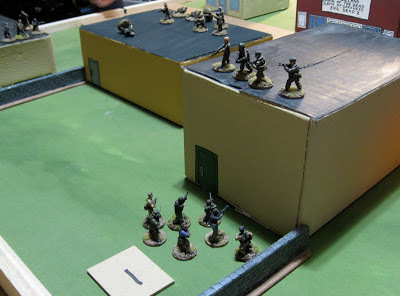 Fire Team #2 moved to the back of the Credit Union and exchange some rather ineffective fire with the group of insurgents milling about behind the building. 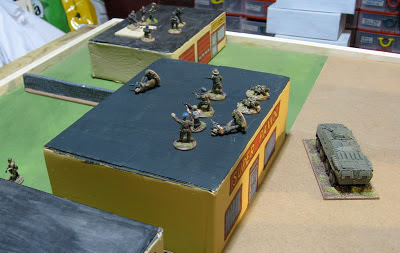 In the end phase the Insurgents poured fire down on the Commies holled up in the super Pawn. 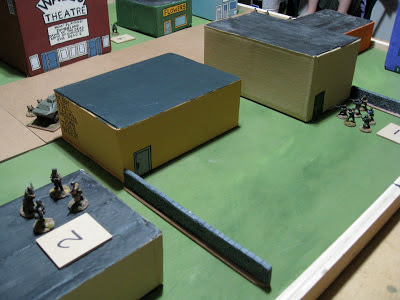 In the exchanges the insurgents in the Service Center suffered two more casualties and one of the groups in Curt’s comic Cave suffered one casualtiy and lost another due to morale. 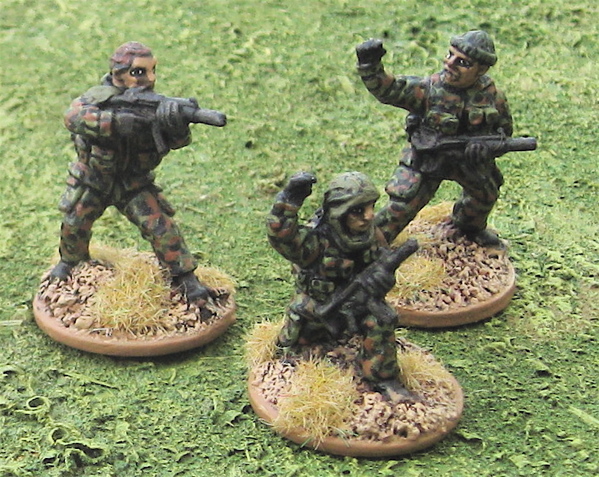 The Insurgents fire on the VDV troopers was more or less ineffective. 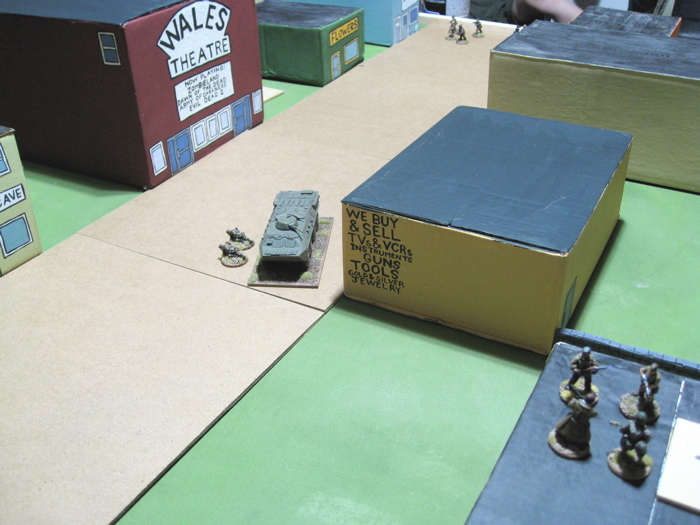 One of the Groups of Insurgents in Curt’s Comic Cave moved out across the street and took cover behind the wrecked APC. Both the insurgents in the Service Center were KIA. Failing their TQ Test they would only be reacting to fire this turn. Across the street in Curt’s Comic Cave the casualty turned out to be only lightly wounded. 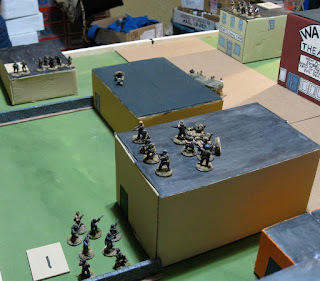 More reinforcements poured in; an RPG Gunner and two with small arms arrived at the Service Center and another insurgent with a rifle turned up behindthe Credit Union. Fire Team #2 was on Overwatch. Fire Team #1 dashed out of the Super Pawn to join the other VDV in the back of the Credit Union. Insurgents failed to react and the Soviets were gone before they could bring effective fire down on them. The Insurgents behind the Credit Union decided to fire on the Commies within but the VDV on overwatch lit them up causing five (FIVE) casualties. The few that were still able to fire caused the Soviets no harm. Of the insurgents shot out back of the Credit Union three were seriously wounded and two were only lightly wounded. 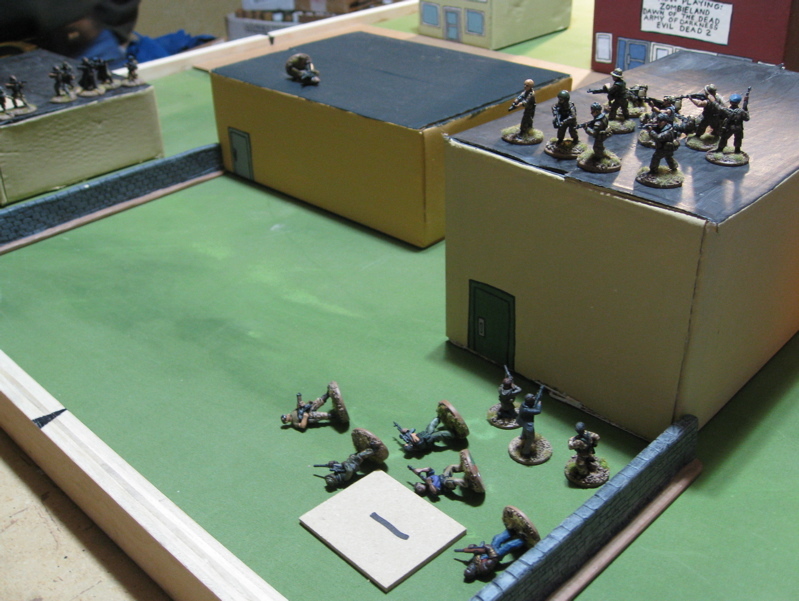 Fire Team #2 fired on the insurgents in at the service center and then left the table. The insurgents just took the fire, hoping to get a shot at the other Soviet team (with the Crewmen). While waiting for that they took two casualties from team #1 (the RPG-gunner and an insurgent with a rifle). Fire Team #1 then made their break for it. the Insurgents failed their reaction roll and the team was gone off the table with their dependant Crewmen and casualties! The soviets left the table with both crewmen and no friendlies left behind for a total of 15 points. The insurgents caused one casualty for 1 point. A pretty decisive victory for the Soviet Occupiers. A second Fog of War card had come out at some point which had no effect. A fun game overall and I think I’m starting to really get my head around the rules – though I think I forgot about the bonus die for being within optimal range a few times. 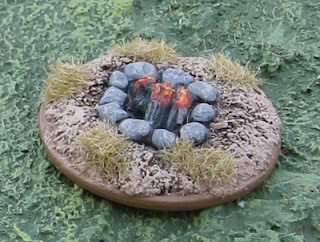 I need to make some better Hot Spot markers... and finish up my roads and some more buildings. 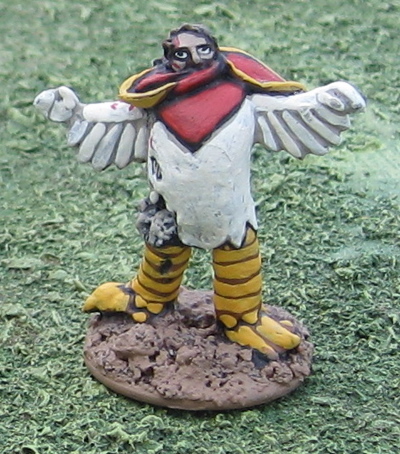 I think I might make some rulers marked out at 40mm intervals - not quite doubling the regular inches used in the game. 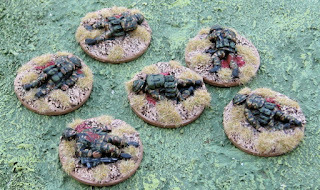 I thought doubling it might seem like crazy distances - rapid moves of up to 24' for infantry!? But it didnt' seem too out of whack for the scale we were playing with. Hopefully I might get in a few more games over the holidaze. 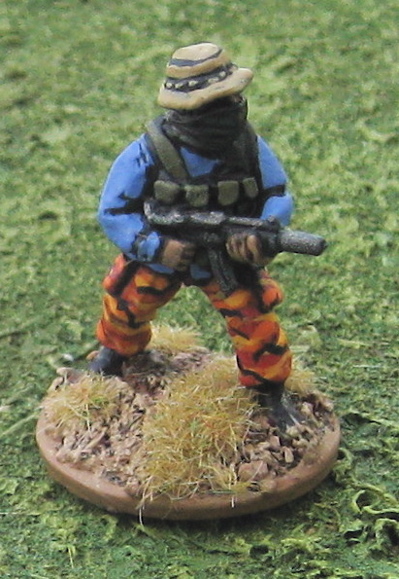 Whether it’s Afghanistan or Burkhadurkastan my mujahideen insurgent-types now have some heavy support! 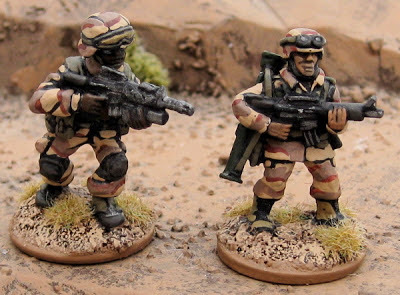 Some Heavy Machine-Guns from Mongrel Miniatures. 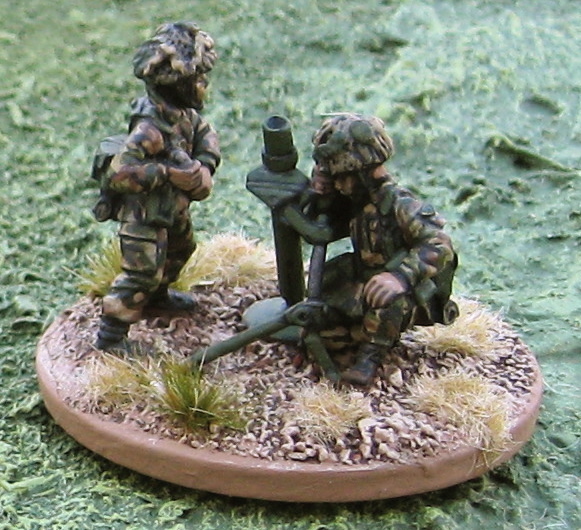 Mortars (also from Mongrel Miniatures). A pair of Mujahideen on a Motorcycle from Empress Miniatures. 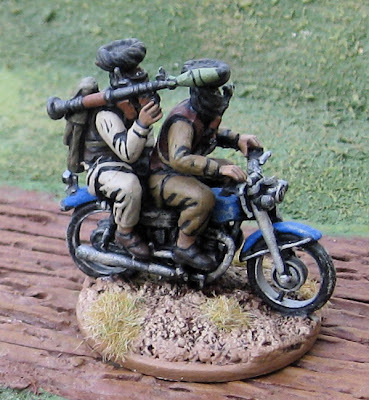 I have a second one that’s just about finished with an RPG team on the bike. Hopefully a game report, actually. Gary is supposed to be coming over tonight to play some Force on Force. (hopefully I’ll have the game table cleaned off by then!). Two US Army Rangers (actually the one on the right might be a Marine…? But whatever, it was sold to me as a “Ranger” and it looks close enough, so that’s what I’m using it as…). 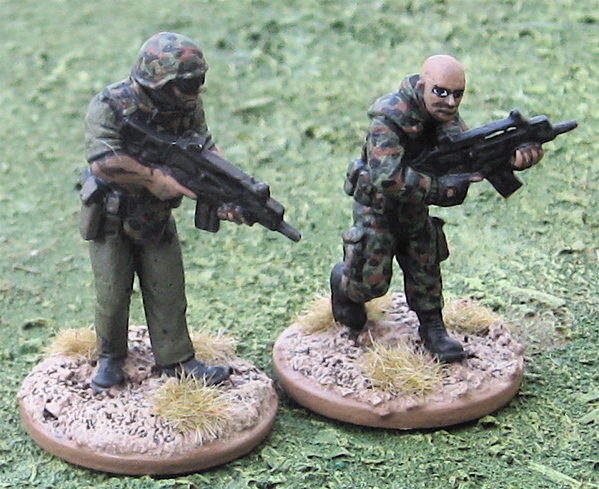 The one on the right is from The Assault Group and the one on the left is from Britannia Miniatures. I can’t get over how much bigger the Britannia minis are!? From left to right: Victory Force Miniatures, Devil Dog Design, Britannia Miniatures, The Assault Group, Empress Miniatures, Eureka Miniatures, and Gripping Beast (MoFo). 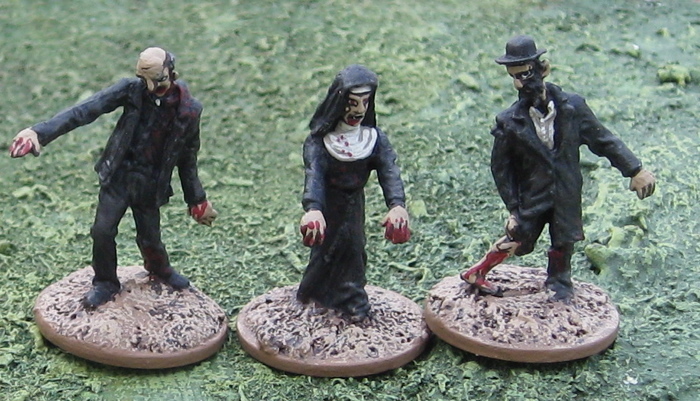 Four Survivors from West Wind Productions. Gosh… hard to say… I have so darn much stuff all over the game table… Marines… Civilians... Germans… Afghans… Zombies… Trucks… Tanks… WW2 Soviets… I think it’s time for a clean up and a sorting out and prioritizing and putting away of those things I’m not immediately working on!